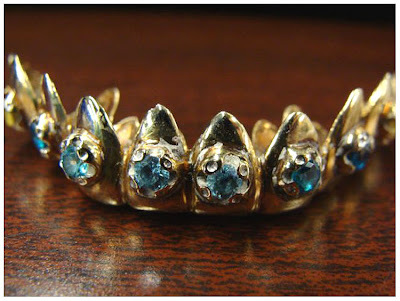 First they increased the price of speeding tickets; now they are selling teeth grills! It's 10 carat gold, worn by a perp, and has topax and citrine stones. It's appraised at $349, and the Nashville police are selling it. The police have assured prospective buyers that it has been "thoroughly cleaned." Palmoni, do you have any opinions on the dollar? Everyone is so bearish I fear a merciless rally might be right around the corner. I also fear Bernanke and Co. may orchestrate a dollar rally/stock market correction in order to help treasury auctions. They can't keep buying their own bonds forever, can they? UUP or UDN, TLT or TBT, that's the question. I think the dollar is getting close to a rally--because our economy is turning. Looks like the sell off was short? Or you think we should wait for a little more consolidation? If the dollar rallies is there any way that stocks won't go down? It's just so hard for this market to have a time correction. Look at AAPL. The whole world laid out shorts on that name yesterday--and today its ripping. It's just exceedingly hard to have any pullback in this environment--but I thought we would at least get a shot --but it looks like this mornings fade on the futures was all we were going to get! These include many of these outstanding games gold! I've had the actual extra tall chocolate brown brown lightly games gold roughly a year at this time and they're really splendid. At the beginning I thought these people were some sort of lot pricy, nonetheless have noticed these were worth it!! As a result fashionable in addition to just the tools for specialized the weather! Cannot simply wait for lots more. Many are outstanding! games gold are so incredibly a lot more very good when compared to the 'knock offs' I'd well before. Immediately following big bring in, the sweater fabric should frequently felt up a lttle bit, although a dress comb attends to the idea. The entire games gold actually are which I expected. They're just nice hip. I am tons of words of flattery as soon as i attract these businesses.